We help active adults in the San Diego area quickly recover from injury so they can return to the workouts and sports that they love. While avoiding surgery, pain killers and the Doctor's office. →We provide 1:1 sessions for up to 60 minutes for injury rehabilitation, injury prevention and performance. → We utilize cutting edge manual therapy techniques, exercise prescription and education in our sessions to help you feel your best. 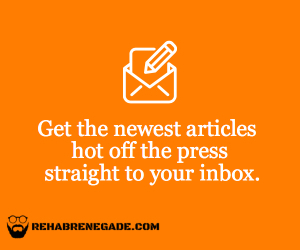 Need Help Deciding If Rehab Renegade PT & Performance is right for you? We understand that you haven’t worked with us before and you may not be sure if we can actually help you. You may have tried “everything” or just had a bad experience with physical therapy in the past. If this sounds like you this a perfect opportunity to see how we can help you. Please fill out this quick form below and tell us more about you so we can answer your questions. You may not be 100% sure if you want to book an appointment yet. You may have some questions that you would like to talk to a physical therapist about first to see if we can actually help you. Please click the button below to schedule a call so we can answer your questions over the phone… completely free, no obligations. If you found your way to our site you are likely in pain, have some type of injury or need an extra boost in athletic performance. If your experience with physical therapy in the past was not a memorable one we can assure you that this experience will be different. We are specialists when it comes to treating the injured athlete in their early 20's to late 60's. Most of our patients aren't willing to accept rest, ice and pain killers as their pain remedy, and neither are we. We don't want you relying on Tylenol and muscle rubs to get you through the day. Do you every wonder why professional athletes seem to recover quicker? It is really somewhat obvious, they have a specialized medical staff that gets working with them the Next Day. That is the complete opposite of how many non-professional athletes handle injury. To no surprise,research continuously shows that the sooner you address an injury the better the outcomes. This means less pain, more weight on the barbell, quicker marathon times and lower scores on the golf course. Most of our patients try to battle through pain or stiffness until they can no longer participate in the activities that they enjoy doing and that keep them feeling healthy. This is often the "No Pain, No Gain Group." Others becomes overwhelmed by their injury, falling back on the old "Hurt = Harm" mindset. Either because they heard it growing up or were told by their doctor that weeks of "bed rest" and ice would be the magic cure all. Unfortunately, that is rarely ever the case and can negatively impact your health and fitness in the long term. How Can Choosing To See a Physical Therapist at Rehab Renegade Help You Get Rid Of Your Sports Injury For Good? We quickly take away pain and stiffness, often times within a few sessions. We can quickly identify the root cause of your pain- often in less than 20 minutes. We can help you decide what the best treatments are and whether or not expensive medical imaging and surgery is the right choice. We can analyze your posture, flexibility, strength and complex athletic movements- like weightlifting, golf and triathlon events. This will help you get back to doing what you love at a higher level. We can help you get back the energy, focus and joy that pain has taken from you. We can help you figure out whether or not your body is healing properly, and how you can speed up the process physically and mentally- while considering nutrition, sleep and recovery strategies. We can help you create the perfect exercise plan that gives you back the independence that you have been looking for. We are solely focused on you during your session, no hopping around from one person to the next. All of our sessions are 1:1 for up to 60 minutes. In most cases you will only need to see us 1x/week for a few sessions to see measurable improvement. We utilize hands on manual therapy treatment, scientifically backed treatment plans and up to date education on how to care for your body. Whether it is a new injury or a chronic injury that has persisted for years, we treat every area of the body from head to toe. If you have more questions please feel free to contact us. If you want to know what it costs & what avialability we have click the button below to fill out a short form.